Andrew Baker tried really hard to find fault with Mission’s superb new standmounts, but failed, miserably. HAVING HAD MISSION speakers as part of my first proper hi-fi setup, it has been a real pleasure seeing the company (under the judicious wing of China’s IAG) putting out some pretty exceptional speakers in the last few years. With bookshelf speakers, floor standers, subwoofers and full A/V packages, Mission are more or less a household name and what’s more, they make speakers even discerning audiophiles can be immensely proud to own. The SX series stands in the mid to high end of the spectrum and feature modern looks and, as can be expected from Mission, exceptional build quality, along with some clever engineering and design. The SX2s are second in the line, with the SX5 floor standers – which I was extremely impressed with when I reviewed them some months back (review here) – at the top. The SX2s are a 2-way bass reflex bookshelf or standmount design and while they are rear ported, Mission have designed them so they can be used close to the rear wall if necessary. Using a 160mm aluminium mid/bass driver and 25mm Titanium metal tweeter (positioned in inverted fashion, as usual, for “perfect time alignment”) the speakers have a frequency response of 58 Hz – 40 kHz (+/- 3 dB) and bass extension is measured at 50 Hz. The tweeter, like the rest of the SX range, uses a phase correcting plate and is housed in an isolated chamber to protect it from low frequency vibrations. 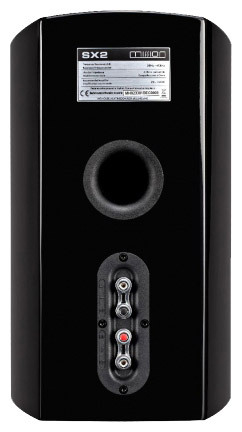 Recommended amplifier power is 20 – 100 watts per channel and sensitivity is 85 dB into 6 ohms, so you’ll be wanting to use an amp with a good bit of current. Weighing 10kg, they certainly feel solid and well-built and with a depth of 365mm, which is the same as the aforementioned SX5s (height and width are 381 x 231mm) they are quite an unusually large size, so a good sturdy set of stands is advisable. The speaker binding posts are excellent quality and two pairs are provided for those wishing to use bi-wire speaker cables. The treble and bass drive units are set into a die-cast aluminium baffle which clamps them securely to the backwards curving cabinet, ensuring good mechanical stability not to mention rather tasty good looks. The cherry real-wood veneer of the review pair looked – and felt – quite lovely; black and rosewood finishes are also available. Attractive fabric covers are supplied and these are attached magnetically so there are no unsightly holes in the front baffle – for, like me, you might be inclined to keep the covers off to better enjoy the aesthetics, if not the sound quality. Positioning the SX2s wasn’t too difficult and while they proved to be fairly unfussy, I would as usual implore you to take your time to get it right for your ears and room. They were connected to my Unison Research valve hybrid with vinyl front end source as well as the mighty impressive new Perreaux Audiant DP32/100P pre/power amplifiers, using the DP32’s built-in USB DAC as a digital source. I can safely say that I was astonished by the bass performance of those huge SX5 floor standers – I could feel the air moving with excitement as the bottom end pummelled my senses with remarkable control and poise – and while I most certainly did not expect such from the SX2s, they still managed to surprise me with their pleasingly extended and rhythmic lower frequencies. The bass was authoritative and controlled, always remaining tuneful without becoming boomy or mushy. Alternating between Benz ACE and Denon DL-103 moving coil cartridges into an Auditorium 23 step up transformer, I played a range of genres of varying quality (production-wise) and found very little to complain about. Listening to Jerry Garcia’s ‘Sugaree’ from his excellent 1972 album Garcia, on which the late great guitar master played almost every instrument, the Missions gave a wonderfully rhythmic bass line which was rich, deep and organic and, along with the drums and percussion, gave the rhythm section a great sense of timing, presence and scale as well as a meaty earthiness. The midrange displayed great openness and detail, lending the speakers a feeling of ease and agility; guitars and vocals had a natural and lifelike edge. Throughout the review, the tonal character of each individual instrument on any given album – guitars, piano, drum skins – was convincingly conveyed and often with near holographic placement of each performer. Mavis Staples’ new album One True Vine, ably assisted in production and execution by Wilco’s Jeff Tweedy (and his son, Spencer Tweedy, who plays drums) in his Chicago-based Loft Studio, is a gloriously intimate, yet funky and affecting, collection of gospel goodness, featuring both covers and original songs. Even for those without a religious bone in their bodies, this album is bound to impress on every level – musically and emotionally. I had the pleasure of seeing Ms Staples perform live with Wilco earlier this year and what a beautiful, soulful woman she is. She captivated the entire audience, drawing us to her bosom with her charisma and love, and that same feeling came through on this new record, thanks in no small part to the open and articulate manner of the SX2s. There was a degree of depth and lushness that even the recently reviewed Castle Howards couldn’t quite achieve, and a most impressive scale. On tracks such as ‘Can You Get To That’, ‘I Like The Things About Me’ and ‘Sow Good Seeds’, bass lines were stonking and powerful with the tone of each plucked note in full view and mid and upper frequencies were full of life; snappy and detailed, without becoming overpowered by the bottom end. Tweedy’s distinctive guitar style was unmistakable, full of reverb and rhythm, but it was Staples’ deep and expressive voice that was the centrepiece at all times. Colourful and powerful, graceful and full of emotion, the Missions did a superb job. Speaking of Wilco, I had a listen to the Crowded House-like ‘How To Fight Loneliness’ from the album Summerteeth on a particularly impressive 180g double LP pressing on Nonesuch Records. It’s a nice, slightly warm sounding recording and the Missions conveyed that warmth along with a heightened sense of intimacy and greater awareness of the recording space – where it seemed I could appreciate the scale and dimension of the room. Lovely billowing organ added richness to the composition and the toothsome bass line didn’t overpower the delicate, almost casually strummed, acoustic guitar, or Jeff Tweedy’s realistically depicted vocal delivery. The SX2s also did a great job of sounding as though they were floor standers and many times I came close to forgetting they are actually stand mounts – their sense of scale and power is so impressive and the soundstage huge – expansive without seeming overly sparse. Not excessively explicit or revealing but well balanced across the frequency range, the speakers impressed on every level, with almost whatever I subjected them to, whether soul, rock, metal riffing stoner-rock, acid-folk-prog-rock (yes, really) or plain old jazz. The funky and labyrinthine title track from Lee Morgan’s The Sidewinder LP with its Latin influence and 24 bar blues chorus was another triumph – groovy, infectious and rhythmic, where the trumpet, played by the ill-fated Morgan, backed by the impressive if un-showy tenor sax playing of Joe Henderson, was measured yet ebullient and sharp, accompanied by bouncy piano and percussion. I got a real feeling of the recording space thanks to those open-sounding drivers, while cymbals and high brass notes were crisp and precise without any over-emphasis from the metal tweeters. The creeping, sullen bass lines on the Cowboy Junkies’ debut album Whites Off Earth Now had great depth and rumble, while the drumming was perfectly timed and lively with nice metallic, fast-sounding cymbal strikes. The notes Michael Timmins caressed, coaxed and wrenched from his guitar displayed great lifelike tonality and presence, snaking and blasting in and around the other performers, and I was impressed with the way the Missions opened the window wide on sister Margot’s impassioned vocals, allowing me to hang on her every fervent word. Junkies albums are usually very well recorded and this one is a particular favourite of mine when it comes to testing new gear, so if it sounds good, I’m sold. Generally the SX2s weren’t too fussy with “lesser” recordings; lo-fi records by Pavement and The Fall (dare I mention those two in the same sentence?) were totally enjoyable and the Missions revealed plenty of detail and charm. I’m not a complete snob when it comes to recording quality, enjoying music for the sake of music rather than seeking out only the best possible audiophile recordings. If love and passion has gone into a record then generally I believe it’s going to be enjoyable to some degree. There are, of course, exceptions to my rule and with this in mind I decided to give my copy of Iggy Pop’s The Idiot a spin. Mine is an original USA pressing from 1977 which I have always found closed-in sounding and rather dynamically squashed; even though I like the music, it’s not easy to listen to. The Missions lent some air to the recording and while, frankly, from a sound quality point of view it still sounded bloody awful, it was at least a dash more tolerable. Perhaps this is a case where seeking out the best possible pressing would be a good idea. I really tried hard to find fault with the SX2s but, for the price, all I could come up with were the painfully difficult-to-remove plastic tabs in the binding posts, which I needed to remove so I could plug in my banana-terminated speaker cables. You’ll need either a sharp knife or fingernails of steel. 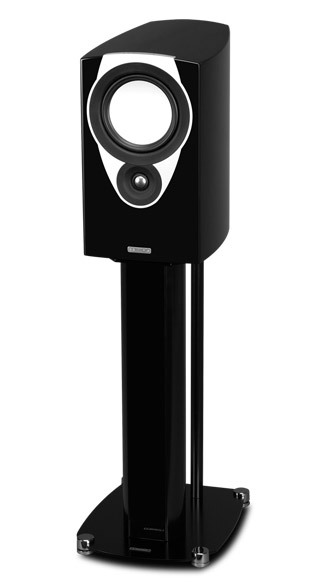 Mission have again come up with a winning speaker in the SX2s. 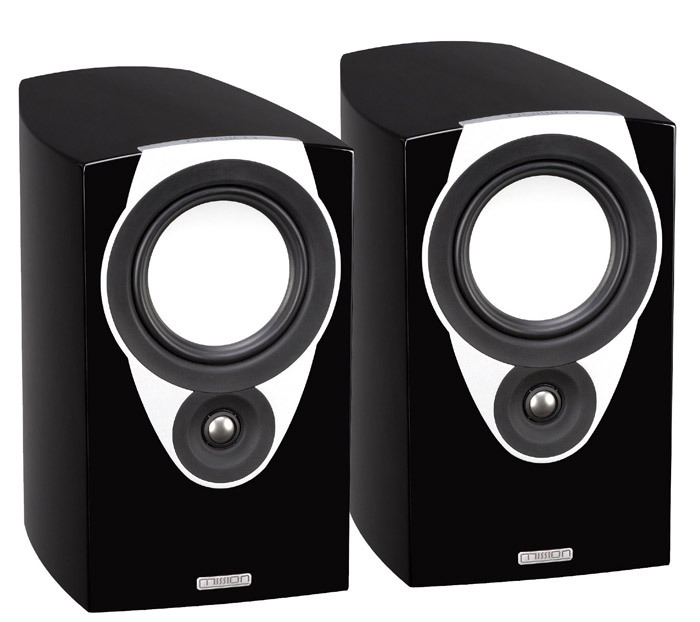 They give what I consider to be superb value-for-money sound performance, with their agile, smooth and open nature. They are not too fussy with regards to positioning and they create a lovely, rich soundstage that stretches out in all directions with great stereo imaging. They have the gift of being able to convey the bass energy, the scale and effortlessness of many floor standers while being suitable for small and medium sized rooms – and even some larger ones (their unusually deep cabinets may pose a problem for some smaller rooms, but given that they work well close to rear walls, it would still have to be worth giving them a try). Like the physically imposing SX5s, they were an absolute pleasure to have in my system. Bass fiends may require a sub or two – or the SX5s – to get their foundations shaking to their liking, but for many of us the bass extension on offer here will be more than adequate. Admittedly $2.5k could be considered a lot to part with, however while they may not display quite the same level of resolution – or be as overtly revealing – as, for example, the ProAc Response D Two stand mounts (which, of course, are nearly twice the price), the Missions still represent exceptionally good value for your hard-earned cash.